NEW YORK/BENGALURU (Oct 31): U.S. stock indexes finished with their strongest monthly performances in four years on Friday, even as they dipped for the day amid a mixed bag of earnings reports. On Friday, CVS Health fell 4.8 percent to $98.78 after a disappointing profit forecast for 2016. The S&P 500 energy index was the best performing sector, rising 0.7 percent. Exxon rose 0.6 percent and Chevron 1.1 percent after better-than-expected results. 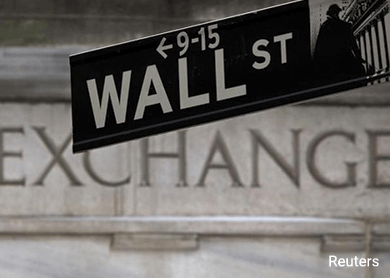 The Dow Jones industrial average fell 92.26 points, or 0.52 percent, to 17,663.54, the S&P 500 lost 10.05 points, or 0.48 percent, to 2,079.36 and the Nasdaq Composite dropped 20.53 points, or 0.4 percent, to 5,053.75. In a signal of a return to calm in markets, the CBOE volatility index fell 38.5 percent in October - its largest monthly percentage decline on record. "We're not likely to see another month like this anytime soon," said Marshall Gause, chief executive of Geneva Fund Partners in Denver. "This month was a rebound off the lows." The S&P healthcare sector index rose 3.1 percent for the week, the best weekly gain since March, spurred by strong pharmaceutical earnings. Shares of drugmaker AbbVie jumped 10.1 percent Friday to $59.55, the biggest positive driver for the S&P 500 index, after better-than-expected profit and a strong long-term outlook. Consumer staples slipped 1.1 percent. U.S. consumer spending barely rose in September and the University of Michigan's index on consumer sentiment came in below expectations. The S&P financial sector index fell 1.4 percent, with Genworth Financial tumbling 10.3 percent to $4.68 after results. U.S.-listed shares of Valeant Pharmaceuticals dropped 15.9 percent to $93.77, its lowest since July 2013, after cutting all ties with specialty pharmacy Philidor. LinkedIn shot up 11 percent to $240.87 while Expedia jumped 7.3 percent to $136.30 after results beat estimates.